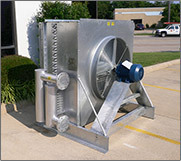 We specialize in Heat Exchangers but also offer other types of coolers and heat transfer replacement coils. Since 1995, Exact Exchanger has been a leading designer and manufacturer of standard and custom fabricated Air-Cooled Heat Exchangers. Products include Horizontal Air Flow Coolers, Vertical Air Flow Coolers, Exhaust Gas Recovery Exchangers, Belt Guard Aftercoolers, Mobile Oil Coolers and Custom and Replacement Coils. All products are pneumatically tested and are available with an ASME “U” Stamp if required. Our custom fabrication capabilities include cutting, bending, punching, machining and welding. We have years of experience building custom products from either concept or CAD drawings. Our customer service team will work with you to manufacture a sound engineered product that meets your specific requirements. Ready to get started? Contact Us Today and learn how our products can improve your business.